Peel the tough outer leaves from the baby artichoke, cut off the stem and halve it. Rub lemon juice on the cut edges to keep it from browning. Cut the rest of the vegetables in bite sized pieces. Leave the cherry tomatoes whole. 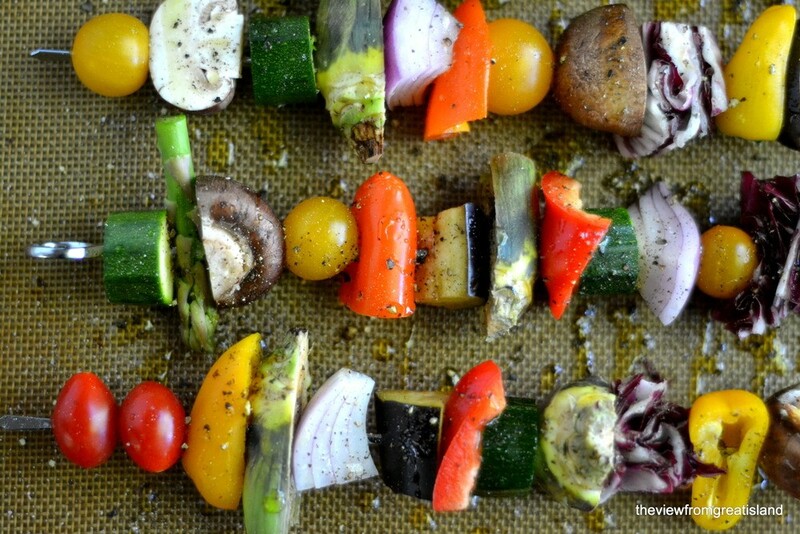 Thread the veggies onto skewers. Lay out the skewers on a parchment or silpat lined baking sheet. This will help with clean-up later. Drizzle the skewers with olive oil and lemon, then sprinkle liberally with salt and fresh cracked pepper. Roast for 10 to 15 minutes until everything is tender and the tomatoes are starting to burst. To make the couscous ~ add the olive oil and salt to the water and bring to a simmer, then turn off the heat and add the saffron, crumbling the threads with your fingers as you add it. Stir and let it steep for a few minutes. Bring the water to a boil, add the couscous and stir well. Turn off the heat, cover, and let sit for 5 minutes.